The new home of a talking newspaper for the blind has been opened with help from a regional daily. Colchester Daily Gazette editor James Wills has officially opened the Colchester and District Talking Newspaper’s headquarters at the University of Essex. The newspaper has been run for the last 40 years and is currently produced by 70 volunteers. It provides recordings to around 100 people in the Colchester area, and content is made up of articles from both the Gazette and the Essex County Standard. 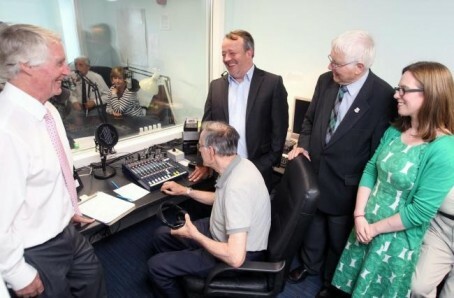 Said James: “It was a privilege to be invited along to the talking newspaper’s new studio. The weekly talking paper is recorded every Thursday night before being posted out to listeners. Chairman Alan Rustage said: “Local newspapers play a vital role for the community and our role is to make sure they reach as much of the community as possible. “We are in the process of digitalising things so instead of the cassette, we are now sending out memory sticks.